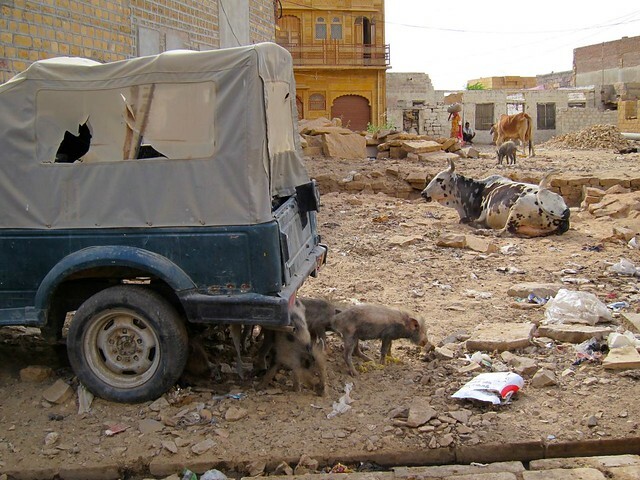 Deserted in Jaisalmer – snackettes. Well, it started out that way, at least. Upon arrival at the bus station, we were able to secure our own seats (a rarity in India), while most of the other hundred-plus passengers crammed into the aisle and into the luggage berth that hung above our heads. For the first couple of hours, we were able to keep our seats, but around that time Steph noticed a little toddler having trouble holding herself up in the aisle among the crowd and the bumps. She motioned to the kid’s mother that the little one could come share a corner of Steph’s seat, and overjoyed, she picked up her kid and promptly wedged her own rather large body along with her little one, into Steph’s seat, smushing Steph into me and me into the wall where we’d remain for the rest of the trip! A misunderstanding? I’m not sure, but the next 3 hours were certainly sweaty…and frustrating. It didn’t help that the guys behind us were pulling Steph’s chair into a 30-degree recline as well, forcing her to hang on to the handle of the seat in front of us. When we finally arrived, Steph had that now-familiar, “I’m pretty tired of India” look on her face. But as the woman picked up her little one and exited, she thanked Steph for the gesture in the little English she knew, and that extra gesture to accommodate us in our language seemed to make it all okay. Like most arrivals on our trip, Jaisalmer’s bus stop had no shortage of hustlers. This time, they were tough desert dudes with aviator glasses driving open-back jeeps, but the shouting and haggling for us to pick their desired hotel was all the same. 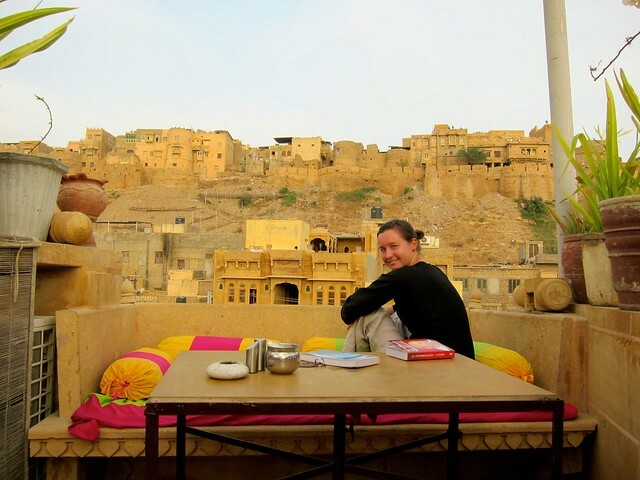 One man was kind enough to offer us a free ride to the hotel we’d already booked so that he could pitch his camel tour company along the way – good deal, and soon enough we were in the comfort of a great spot, Shahi Palace, with great views of the fort from the rooftop. 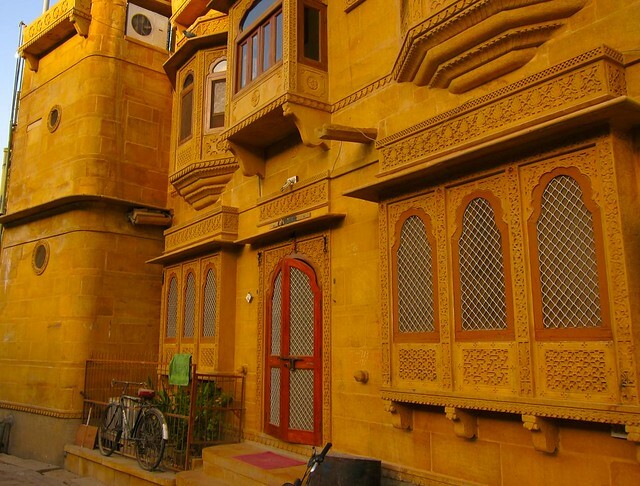 Jaisalmer is the oldest “living” fort in the world, with a certain portion of the city’s population residing within the walls of the sandcastle that dominates the skyline, while the rest of the city has sprawled out into the desert in more recent years. 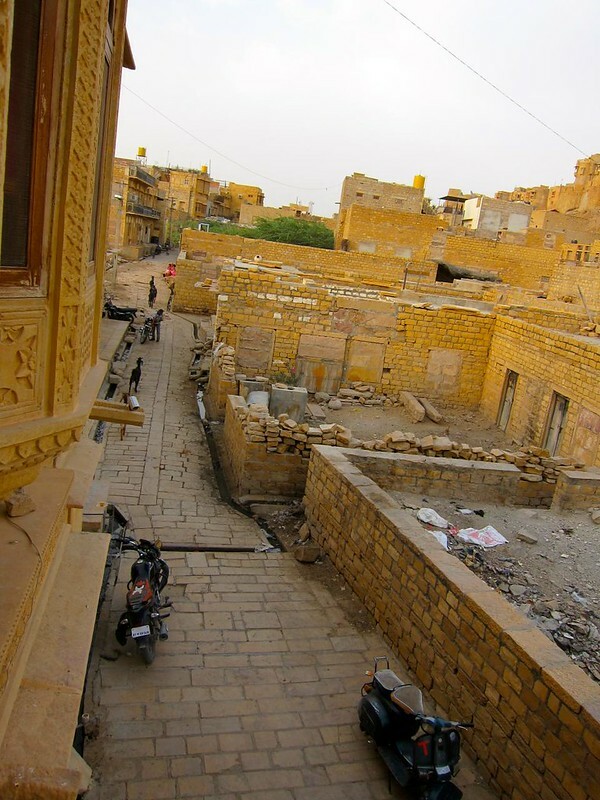 Jaisalmer is classic desert living: dry, hot, and very remote, and its inhabitants bare a little more of a middle-eastern look and dress as well, making it appear as if we’d been dropped somewhere in the middle of Pakistan (which makes sense, as we weren’t but 40km from the border). The first morning of our stay, we set off up the hill to explore the fort. 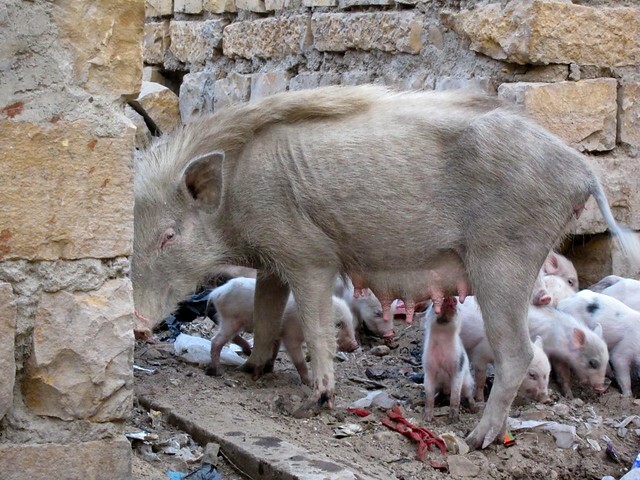 Along the way, we found all sorts of animals roaming the town, including a family of wild-looking pigs who lived across the street. 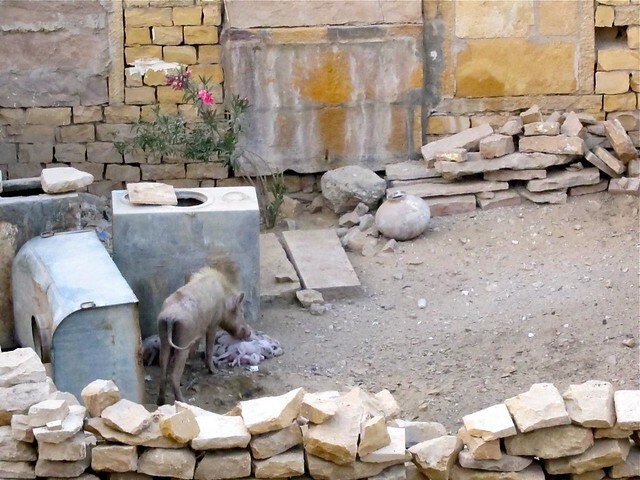 We also found all the familiar hard-to-ignore Indian city sights and smells: poop of undetermined origin on the streets, the strong ammonia scent from men peeing on the walls, plus loads of sand saturating the air. Within the fort, conditions seemed to improve, in at least that the poo on the ground was now clearly from the hordes of cows wandering its cobblestone alleyways (rather than people), and those cows were, as usual, very cute. We learned that each cow does have an owner, and it’s at the doorstep of that owner’s house where a cow will return each morning and night to wait for its serving of Chapati! 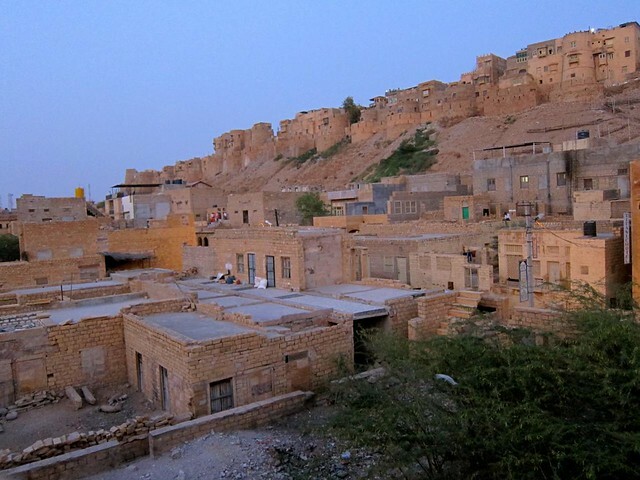 Wandering the fort was a highlight of our time in Jaisalmer. 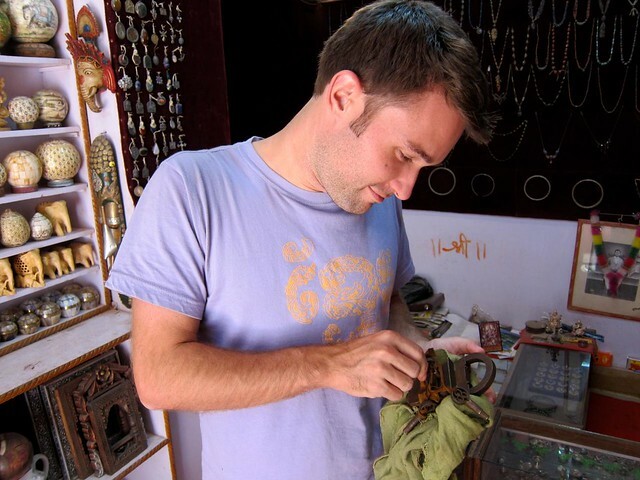 Though many sections were unfortunately tourist-developed with homemade Lonely Planet certification banners bragging for each hotel’s popularity, it wasn’t hard to see and imagine the magical place it once was, and the shops made and sold genuine and beautiful homemade goods. We wandered up and down the alleys, dipping into a store here and there, and were often offered a cup of chai while the shop owner laid out his best wares on the floor in front of us. 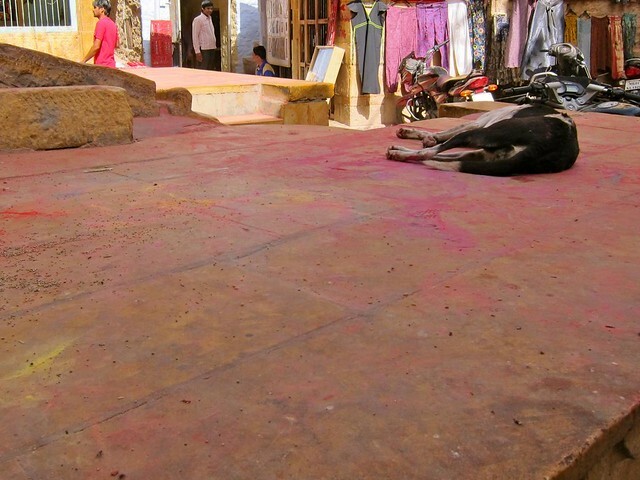 A dog sleeping on top of colored powders left over from the recent Holi festival, when everyone has festive, powder-throwing fights in the streets. Steph with her free chai, shopping for table runners made from patches of Hindu and Muslim dresses. 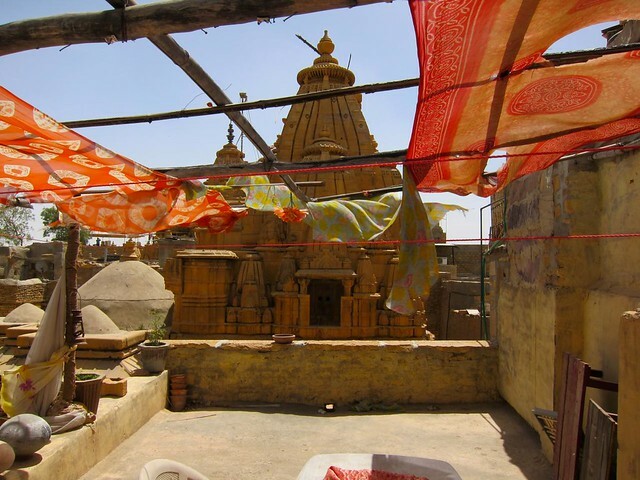 A view from one of the rooftops in the fort, looking across at a Jain temple. A cow resting in the fort. 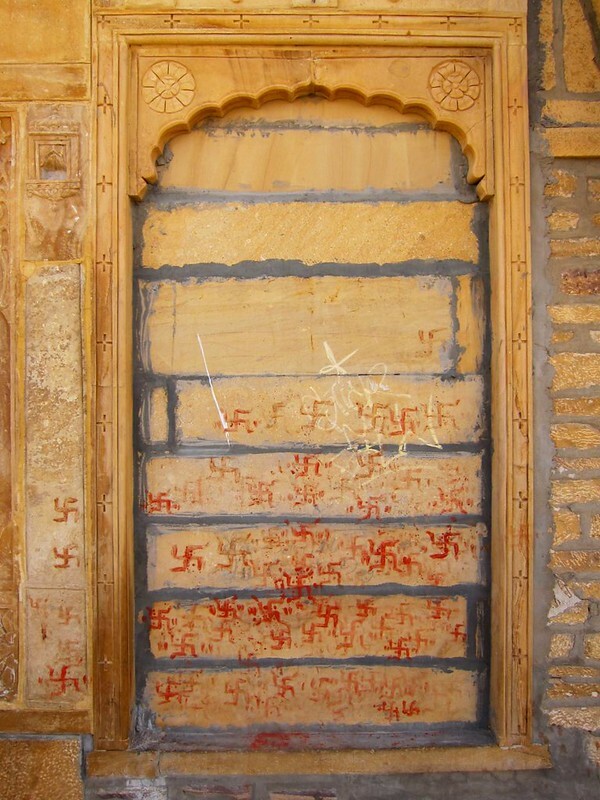 Hindu swastikas (not nazi ones). 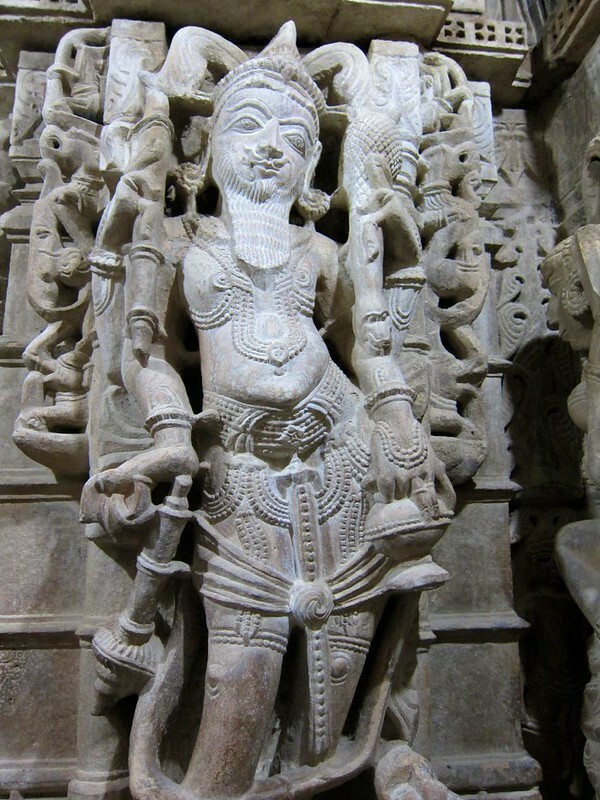 In the Hindu religion, swastikas represent good fortune. A painting of Lord Ganesh, which was commonly seen next to each home’s front-door. We met a man on the street one day who was playing an old violin-like instrument and singing loudly. We sat and listened for a while, enjoying a few songs, such as the one in the video below, which he told us was traditionally sung to a couple who have just been married. 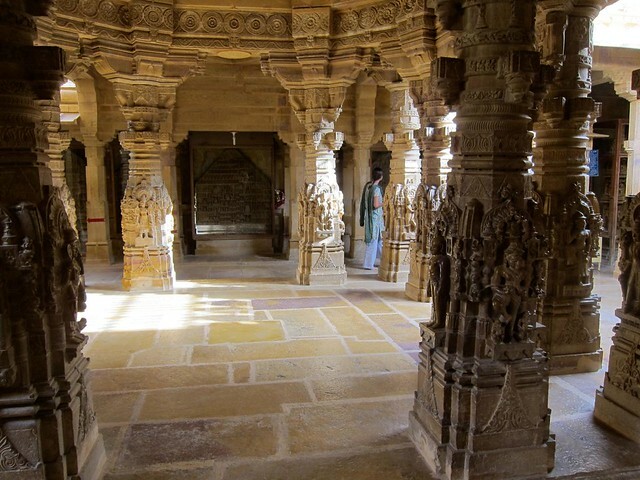 We also toured several of the ancient havelis (mansions from noble families), both unofficially and on official terms with paid-entry and audio-tour headphones to boot…. Me, ready to rock the haveli tour. Peering out from the walls of a haveli hallway (2). A practice horse, for royal children to be towed around upon. 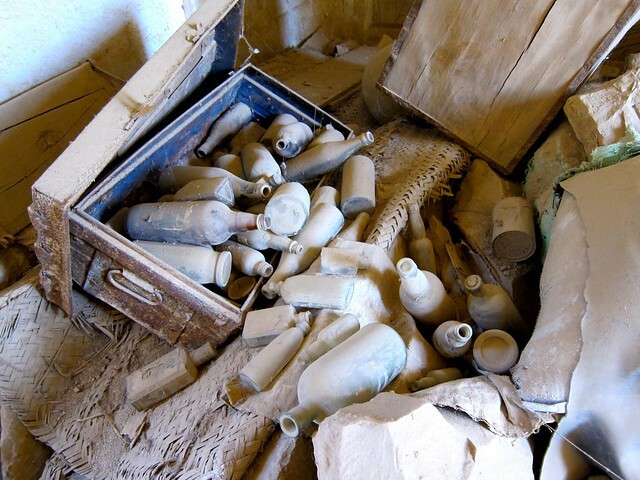 …and also unofficially, when invited by a shop owner who was restoring a haveli of his own. 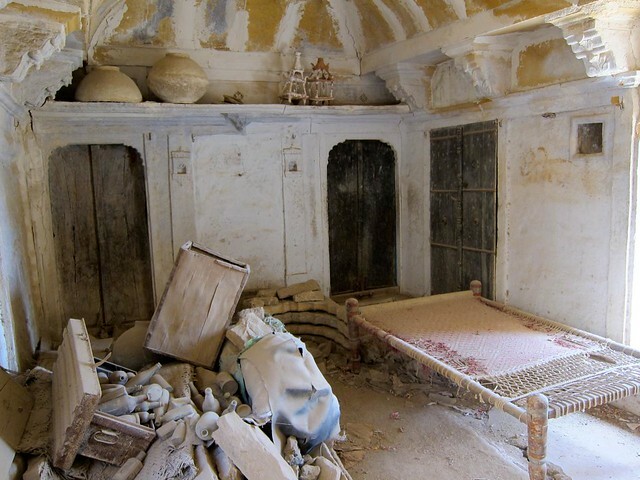 This haveli was once this man’s great-great(-great-great-great?) grandfathers home, and in dire need of repair. One morning, we entered the fort to find a festival underway; Gangaur festival to be precise, which is celebrated annually throughout Rajasthan. Is there anything more colorful than a festival in India? 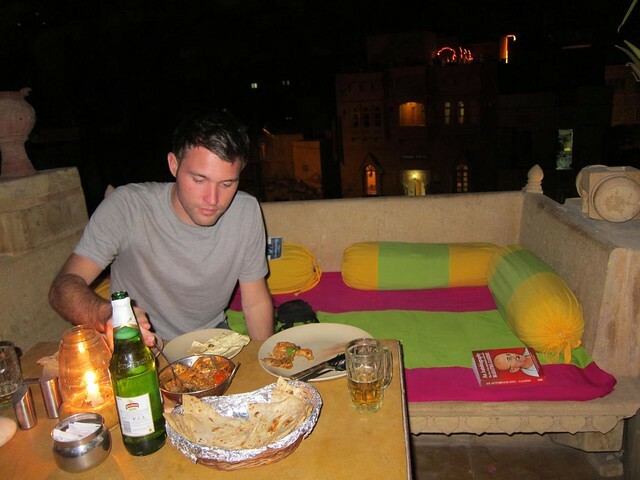 We concluded most days on the rooftop of our hotel, with cold beers and delicious, rich food from the restaurant. As we’d been staying at the hotel for a little while, we eventually made friends with the kitchen staff, and we were invited to learn how to make proper chapati, masala chai, and more. According to Steph (as I wasn’t feeling well enough to attend the lesson that night), the cleanliness and hygiene in the kitchen was pretty unfortunate, and given the chance, she would have added a few line items to their recipe prep, such as hand washing, not nose picking, and more. But the staff was friendly, and the food was cooked piping hot, so hey, who are we to judge? The cooking lessons became a regular thing, and anytime we were on the rooftop, they’d grab Steph whenever a customer placed an order for a new dish. One night, the cook who we’d befriended asked if we do any Indian cooking at home (“are you cooking in your country?”). We mentioned that we can’t easily find the quality of spices they use in India, but that at home we would “try”. …And off she went to learn his chai recipe, which Steph wrote down so we can try it when we get home. The remainder of our time in Jaisalmer is an event in itself: an overnight camel trek deep into the Thar Desert. We’ll follow up on that separately.